Relationship management refers to a series of operational processes that define the type of relationship between stakeholders who are involved with a project, and maintains good conditions to guide the project successfully. Its objective is to achieve the project to the satisfaction of customers/stakeholders and to further aim for the maintenance and development of the project in a continuous and sound relationship with stakeholders. In the operational processes of relationship management, three steps are considered: "planning", "maintenance", and "restructuring" of relationship. When it comes to relationships in a project, the first thing to do is to define what stakeholders become involved with the project in what positions. For instance, in a project of constructing a building, a property owner, a builder, tenants, local residents, architect's (ffice, contractors, and banks will be involved. They are stakeholders and the process of defining their lineup and a manner to associate with them is called the "design of relationship." • Prior agreement by concluding a contract. 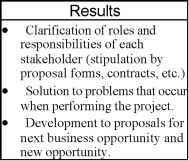 • Be aware of the viewpoints to satisfy stakeholders. • Respond quickly and ensure confirmation and storage of the process and results with documents.